Sunday. In need of somewhere tasty for lunch post Warby Parker try on session. Destination: Il Buco Alimentari & Vineria on Great Jones Street. It’s so warm and inviting once you step inside. The ceiling is copper tiles which creates this warm glow over everything. We stopped in here while walking by not that long ago and bookmarked it. Part grocery at the front, communal tables in the back. It’s just such a great setting and really yummy food. 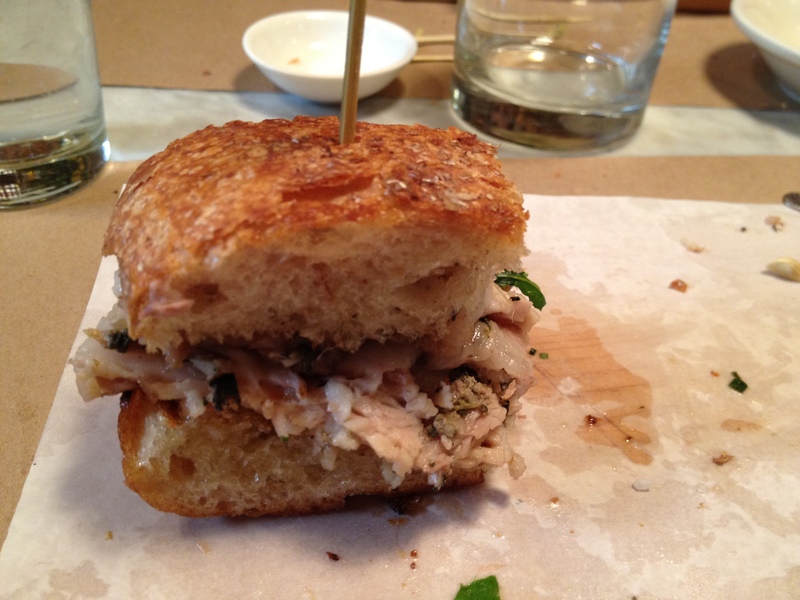 I had the porchetta sandwich. The pork was so flavorful, with just the right amount of tasty pork juice to soak into the bread. Yes, greasy fingers, but it was oh so good. M had the short rib sandwich. And we started with fried artichokes. We couldn’t even finish our sandwiches.